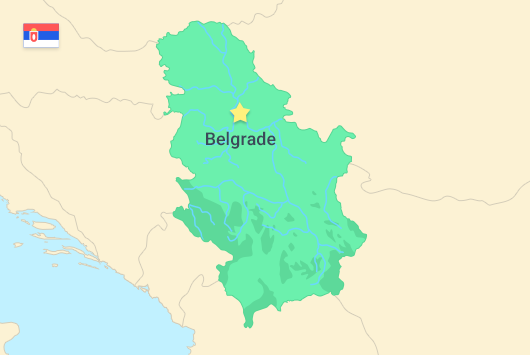 Situated in Southeastern Europe, Serbia is home to over 7 million citizens. The country is landlocked, and borders Hungary, Romania, Bulgaria, Macedonia, Croatia, Bosnia-Herzegovina, and Montenegro. It ranks somewhat highly on the Human Development Index which measures a mixture of life expectancy, education, and per capita income. Since the 1990s, the country has faced a demographic crisis and its population is one of the fastest shrinking in the world. Serbia has an emerging economy largely made up of services, which accounts for 60% of the country’s GDP. The average monthly salary in Serbia is significantly lower than in other developed countries around the world, and currently stands at the equivalent of $530. The nation also has a high unemployment rate at 17.9% as a result of difficulties the country faced in the aftermath of the 2009 financial crisis. Because of this, many talented and educated Serbians are turning to remote freelance work for employment. Freelancing offers young Serbians the chance to use their skills and expertise to earn significantly more than they would be able to in their home country, while not requiring them to relocate. Despite having a high rate of unemployment, Serbia’s citizens are largely well-educated and literacy rate stands at 98%. 16% of the population has completed higher education, and a further 49% has completed secondary education. Because of the country’s high unemployment rate and lack of well-paying job prospects, the number of Serbian remote freelancers is increasing each year. The increase in remote freelance employment has led to young professional Serbians experiencing a better quality of life than previous generations and many of their peers. Because of this, many young Serbians are highly motivated to increase their earning potential through remote freelance work. Serbian freelancers offer a wide range of skills from translation work to software development. The freelance industry in the country is growing rapidly and because of this many Serbian freelancers are educating themselves so they are able to offer better and more valuable skills. Freelance platforms have seen Serbian software and app developers become established figures in the community. Many Serbian freelancers are also establishing remote online agencies to cater for international demand for development and translation services. Many of the country’s freelancers have an incredibly good understanding of the English language, and because of this, they are able to communicate with a range of international clients. This fluency also means Serbian freelancers are able to offer expert translation services to businesses looking to enter new markets. As well as offering in-demand freelance services like software development and document translation, the country is also home to talented freelancers in specialist areas like scientific research and engineering. For international transfers to Serbia, it is recommended to use an online currency transfer facility like PayPal. However the country is becoming an increasingly better place to do business with as a result of large infrastructure improvements.